This is three stories of the "Georges" that overlap and also belong to her 30-year series of Rogue books. I hadn't read Jo Beverley for a while and I was happily reminded how good she is. The characters learn, grow, and are definitely not dull. Each hero and his heroine make up a unique pair with the heroes life-long friends and the heroines strong women who know what they want and how to get it. The time is after the Napoleonic wars and that is an important background. It helps to have read earlier ones in her Rogue series for context but this is a definitely enjoyable set even without the earlier books. 5.0 out of 5 starsJo Beverly is an intriguing story teller weaving rich characters into unexpected plot lines. I thought this was a stand alone novel that had three parts (novellas). After I finished, I found out it is one of a series of interconnected novels that were written over a 30 year period. Jo Beverly has created wonderfully complex characters who make up "The Rogues". They are a group of friends who banded together in boarding school to protect one another from bullying. When I finished this book, I immediately went back to the beginning of the series to see how all the threads came together for this book. I plan to read the last novella again once I finished those that precede it. The novels are set in England during the Napoleonic wars. They all include an element of mystery requiring The Rogues to work out a solution. There are many humorous moments and for the most part the romantic scenes are not overly graphic. I plan to read them all. A collection of three novels concerning the return from Waterloo of three childhood friends all named George. They took new nicknames Van, from Vandimein who tattooed a demon on his chest; Con from Conaught, who was a rogue and heir to the Earl of Wyven or dragon thus had a tattoo of one; and Hawk of Hawkinsville with the appropriate tattoo also. These three books are interrelated and having them together like this is very handy and appropriate. Throughout also there are links to the main Rogue Series. By the last of the three novels the Rogues and Georges merge with the solution to the death of the greatly mourned Lord Dare. 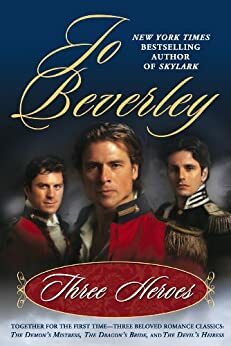 "Three Heroes" by Jo Beverley is a mini collection of the men and women of The Company of Rogues love stories/action adventure series, that are all tied together around the battle of Waterloo. For some strange reason, Jo Beverley's books are hard to find, and when you do find one, you feel like you've struck gold. Her plots are well constructed, and the stories flow well. The characters, both the men and the women, are interesting, decent people. Her research, and also her editing and proofreading teams are excellent. If you love historical romances, and good love stories with a little mystery thrown in, this is the book for you. You might also enjoy "Hazard", and "The Shattered Rose". 5.0 out of 5 starsThe Three Georges Wow!! These guys are terrific. They grew up together in the same area, played together when young and formed lasting friendships. Van Vandeimen,Hawk Hawkinville,and Con Sommerford. They are the three Georges. Because of confussion they changed their names from George and got tatoo's, A Devil, A Hawk and a Dragon. Only one of the Georges,(Con) is a Rogue but through him they are all part of the same group. We also find out what the tatoo's mean and why they have them. They were all hurt and scared by the war where they lost many friends and comrades. The stories are about three men and the three women in their lives and how they help bring their men back from the brink of, hurt, financial disaster, and even death. Interwoven throughout are the Rogues and how they help and how the Georges even come in to save the day. There is wonderful character developement, funny and heartwarming dialogue and at the end we find out what happened to Dare and Maria Theress, Nicholas Delaney's nemesis. You have to Read An Arranged Marriage and an Unwilling Bride before you can truly understand and appreciate the last book of the Heroes called the Devils Heiress and see that it is the culmination of many Rogue intrigues. Yes it is long but it is two entire novels and a novella. You will smile and say thank heaven, but you WILL enjoy it. But read the other books first so that you can understand and appreciate everything that takes place. This book helps to set up what happens in Hazard. Another company of Rogues book. All are Wonderful Reads.